Some believed that Snell’s strange sense of foreboding came not from some pyschic feeling, but, perhaps, from some sort of warning from the recently-freed burglar, and that burglar was one of the first men rounded up. But he was found innocent very quickly. The Snell Mansion at the time of its destruction Evidence that it had been a two-man job was fairly overwhelming: there were two sets of tracks in the snow, and two kinds of bullets in Snell’s body. But, when no solution had been found after 10 days, the frantic police decided that it had been the work of one person: Willie Tascott, a young man who lived on Ashland near Union Park before becoming something of a drifter, working for railroad companies all over the country, serving some jail time in Kentucky for robbery, and eventually drifint back to Chicago working odd jobs, including operating the elevator at the Palmer House Hotel, while engaging in some petty thievery here and there. A few days before the murder, Tascott went to a jeweler to have a pearl set in a ring. The jeweler noticed his strange bag of tools and asked if he was a piano tuner. “Hell no!” Willie replied. “I’m a burlgar!” The jeweler thought he was joking. A few days later, he bought a set of tiny saws and tools – the kind used by burglars. These very tools were the ones the police said were found on the scene. The night of the murder, a witness described encountering Tascott on the street and, in the process of flirting with him, asking about his bag of strange tools. “I’m a crook,” he said, casually. He then showed her some sharp manuevers with two pistols that he carried – proving, the police said, that the two kinds of bullets could have been fired by a single person. This didn’t explain the footprints, or WIllie’s alibi (his brother said he had been with him the whole night), but Willie Tascott disappeared. A world-wide hunt ensued, but there was no picture, or even a good drawing, to help anyone identify the guy. Clues and sightings poured into the police station for decades, and several people were arrested around the world on suspicion of being him, but Tascott was never found, and the murder of Amos J. Snell was never solved. 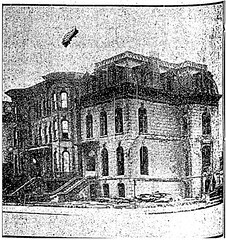 The Snell Mansion was torn down in 1923. Few traces remain on Washington Blvd to indicate that it was ever a fashionable haunt for Chicago’s wealthiest citizens.